That is what it means to be queer. It means we love outside the lines. We are dissidents for love. We love in spite of obstacles. Queer people have the potential to show forth in a particularly vivid way the God-given capacity to love in spite of obstacles—in spite of homophobia, in spite of state sanctions, in spite of family expectations, in spite of workplace discrimination, in spite of rejection from our religious communities, in spite of all the accumulated wounds incurred by being people who do not conform to cultural norms. Our ability to love outside the lines of compulsory heterosexuality grants us increased capacity to form chosen family with all dispossessed people. In Mark 10, Jesus assures his disciples that whoever has left behind the privileges of the dominant culture to follow him will receive “a hundredfold now in this time, houses and brothers and sisters and mothers and children and lands….” We receive a new family. And, he assures us, we will receive this family “with persecutions.” Why? Because when we allow our suffering to draw us into solidarity with the suffering of all dispossessed people, we will also be drawn into conflict with the powers that hold that dispossession in place. 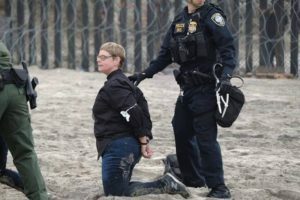 razor wire, metal fence, contaminated surf, and heavily armed border patrol officers. The action was called “Love Knows No Borders, or El Amor No Conoce Fronteras,” and it was organized by the American Friends Service Committee and other immigrant rights organizations. I believe that if we want to call ourselves queer in this time, in this moment in the history of a racist, genocidal, imperialist nation, then we need to allow our queerness to lead us to love across borders and struggle for the recognition that we are all one interdependent life commu-nity. We cannot rightfully claim the status of “queer,” which is always a position of dissidence, without positioning ourselves in opposition to everything in this country that stands against love. We cannot heal from the wounds of heteronormativity without doing this, because our own liberation is bound up in the liberation of all people everywhere who are being dispos-sessed, pressed down, brutalized, and locked out or locked up. I become fully human and fully alive by honoring, serving, protecting, and fighting for your full humanity and full aliveness, no matter who you are. Within this paradigm, we can use what is hurting us to connect to the suf-fering of everyone else on the planet. We can enter into solidarity with all life and work to-gether for our common liberation. Our status as love warriors gives us a unique power. Outside of the power to shout and shoot, outside the power of the empire, there are yet other forms of power which arise out of our being bound up with the ground of life, the river of life, the tree of life. The grass that grows into the light through asphalt also has power: not power to command, to rule, to manipulate, but a pow-er which comes to life from a relationship. This is the power of queerness consciously under-stood. Al Otro Lado. Based in Los Angeles and Tijuana, this legal aid group’s Border Rights Project helps asylum-seekers navigate the process. Nichola Torbett is a spiritual seeker, recovering addict, gospel preacher, podcaster, writer, resistance fomenter, dog-walker, nonviolent direct action trainer, and aspiring race traitor. Driven by her passion for both spiritual formation and social change, she co-founded Seminary of the Street, a training academy for love warriors, in 2009 and Second Acts, a liturgical direct action affinity group, in 2014. She is co-editor of RESIPISCENCE: A LENTEN DEVOTIONAL FOR DISMANTLING WHITE SUPREMACY and a contributor to THE WORD IS RESISTANCE, a podcast of SURJ-Faith, as well as THE YOKE, JESUS RADICALS, radicaldiscipleship.net, and other radical discipleship publications.